growing, learning and changing: Ouch! I Feel So Old!!!! Heard this on the tv today as Kru was getting ready to watch his favorite show, The Backyardigans. 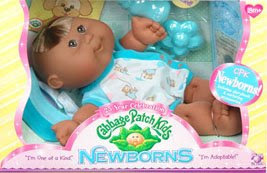 Yes, I guess I was 10 years old when I wanted a Cabbage Patch Doll for my birthday! And yes, that does mean I'm 35 almost 36!!! OOOO I FEEL SO OLD!!!!! I'm almost tempted to buy the cute African American newborn! It's so sweet!!! You see, when I was 10, I wanted a black baby! Not a doll mind you, but a real life black baby! I have always wanted to be a mother!!!! There was a lady who made dolls in our church and they had her make me my very own African American homemade Cabbage Patch looking doll. (I would take a picture of her, but she is up in the attic in some box!) She wasn't a newborn at all, almost weighing 10 pounds, but she was a black baby. My parents made sure that I knew that this would be the only black baby I ever had! I'm so embarrassed to even write that! Because my heart is so not there and has never been there! I'm not claiming that I'm not prejudice, because I honestly believe that we can not grow up and live in America and not have some prejudice within us. I pray that as the Holy Spirit grows and changes me that that would lessen and that Christ's love would flow through me and out of me! I love being in a church with families that adopt no matter the color of skin. I love being able to be a part of their families! The picture of adoption and the things that I have learned from these families has been wonderful.